Mit brennender Sorge ( listen ) (German; English: With Burning Concern) On the Church and the German Reich is an encyclical of Pope Pius XI, issued during the Nazi era on 10 March 1937 (but bearing a date of Passion Sunday, 14 March). Written in German, not the usual Latin, it was smuggled into Germany for fear of censorship and was read from the pulpits of all German Catholic churches on one of the Church's busiest Sundays, Palm Sunday (March 21 that year). 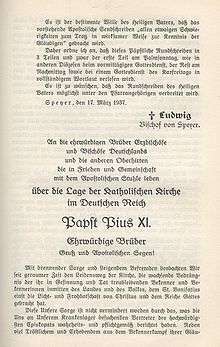 The encyclical condemned breaches of the 1933 Reichskonkordat agreement signed between the German Reich and the Holy See. It condemned "pantheistic confusion", "neopaganism", "the so-called myth of race and blood", and the idolizing of the State. It contained a vigorous defense of the Old Testament out of belief that it prepared the way for the New. The encyclical states that race is a fundamental value of the human community which is necessary and honorable but condemns the exaltation of race, or the people, or the state, above their standard value to an idolatrous level. The encyclical declares "that man as a person possesses rights he holds from God, and which any collectivity must protect against denial, suppression or neglect." National Socialism, Adolf Hitler and the Nazi Party are not named in the document. The term "Reich Government" is used. According to Ventresca, Cardinal Faulhaber, who wrote a first draft, was adamant that the encyclical should be careful in both its tone and substance and should avoid explicit reference to Nazism or the Nazi Party. Historian William Shirer wrote that the document accused the regime of sowing the "tares of suspicion, discord, hatred, calumny, of secret and open fundamental hostility to Christ and His Church". According to Scholder, the leader of the German Bishops conference, Cardinal Bertram, sought to blunt the impact of the encyclical by ordering that critical passages should not be read outloud. Pius then went on to describe how people were obliged to believe in Christ, divine revelation, and the primacy of the Bishop of Rome (Sections 14-24). The Nazi principle that "Right is what is advantageous to the people" was rejected on the basis that what was illicit morally could not be to the advantage of the people. Human laws which opposed natural law were described as not "obligatory in conscience". The rights of parents in the education of their children are defended under natural law and the "notorious coercion" of Catholic children into interdenominational schools are described as "void of all legality"(sections 33-37). Pius ends the encyclical with a call to priests and religious to serve truth, unmask and refute error, with the laity being urged to remain faithful to Christ and to defend the rights which the Concordat had guaranteed them and the Church. The encyclical dismisses "[Nazi] attempts to dress up their ghastly doctrines in the language of religious belief. ": Burleigh also notes the encyclical's rejection of Nazi contempt for Christian emphasis on suffering and that, through the examples of martyrs, the Church needed no lessons on heroism from people who obsessed on greatness, strength and heroism. In April 1938 The Vatican newspaper L'Osservatore Romano would display for the first time "the historic headline" of "Religious Persecution in Germany" and reflect that what Pius XI had published in Mit brennender Sorge was now being clearly witnessed: "Catholic schools are closed, people are coerced to leave the Church..religious instruction of the Youth is made impossible.. Catholic organisations are suppressed..a press campaign is made against the Church, while its own newspapers and magazines are suppressed.."
Coppa, Frank J. (1999). Controversial Concordats. Catholic University of America Press. ISBN 978-0-8132-0920-3. Courtois, Stéphane; Kramer, Mark (1999). The Black Book of Communism. Harvard University Press. ISBN 978-0-674-07608-2. Falconi, Carlo (1967). The Popes in the Twentieth Century. Feltrinelli Editore. 68-14744. McGonigle (1996). A History of the Christian Tradition: From its Jewish roots to the Reformation. Paulist Press. ISBN 978-0-8091-3648-3. Shirer, William L. (1990). The Rise and Fall of the Third Reich. Simon and Schuster. ISBN 978-0-671-72868-7. Pham, John Peter (2006). Heirs of the Fisherman: Behind the Scenes of Papal Death and Succession. Oxford University Press. ISBN 0-19-517834-3. Phayer, Michael (2000). The Catholic Church and the Holocaust, 1930-1965. Indiana University Press. ISBN 0-253-21471-8. Rhodes, Anthony (1973). 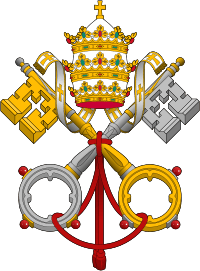 The Vatican in the Age of the Dictators (1922–1945). Holt, Rinehart and Winston. ISBN 0-340-02394-5. Scholder, Klaus (1989). Requiem For Hitler. SCM Press. ISBN 0334022959. ↑ "Before 1931 all such messages [encylicals] were written in Latin. The encyclical Non abbiamo bisogno of June 29, 1931, which condemned certain theories and practices of Italian Fascism, particularly in the realm of education, and denounced certain treaty violations of Signor Mussolini's Government, was the first document of that kind that appeared in a language other than Latin. ", The Catholic Herald, "FIRST ENCYCLICAL IN GERMAN", PAGE 3, 9TH APRIL 1937 Archived 27 May 2014 at the Wayback Machine. ↑ Rhodes, Anthony. Vatican in the Age of the Dictators, 1922–1945. pp. 202–210. ISBN 0-340-02394-5.